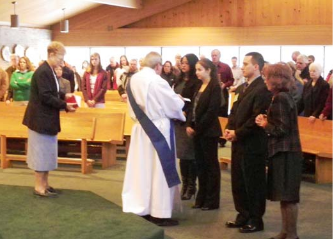 The Rite of Christian Initiation of Adults, sometimes referred to as the RCIA, is the process whereby adults enter the Catholic Church. RCIA meetings are generally held weekly and over the course of several months those who attend continue their journey of faith with us and a sponsor learning about what the Catholic Church believes. They are encouraged to come with their questions and learn in an adult-style setting involving discussions. Because each individual is different, it is important to meet with the RCIA Director, Sr. Lu Haidnick, C.D.P. to share his/her previous religious education on Scripture, Prayer, and Christian beliefs that are basic to every Christian. This helps us to determine how to meet the individual and help them along their personal journey. Some come who are already baptized whether they attended any Sunday school or not; others are not baptized and yet often know quite a bit about Christianity. We try to meet each person where they are. During the RCIA, the sessions help the person to understand what Catholics believe providing information (focus on the head) and formation (focus on the heart.) The heart, that is one’s personal relationship with God, is the most important with the information helping provide the background. 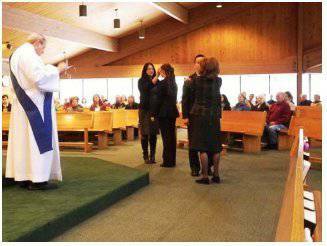 Movement from one stage to another is generally marked with a ritual where a sacred and public witness is made. The journey culminates in the Sacraments of Initiation (Baptism, Confirmation, and Holy Eucharist) at the Easter Vigil Mass on Holy Saturday with a follow-up of weekly gatherings until Pentecost. …then give Sr. Lu a call at ext. 222, or E-mail her at lhaidnick@olphaurora.org.